The cranberry and fudge fillings are layered into the cheesecake in three layers, the final one being on top for decor. With each layer, the fillings are swirled into the cheesecake. As the cranberry filling and chocolate filling sit prior to adding to the cheesecake, they can start to thicken. Just give them a good stir before dropping by the spoonfuls into the cheesecake filling and it’ll make them a little easier to swirl around. 1. To make the cranberry filling, add the cranberries, sugar, cornstarch and water to a medium saucepan. 2. Cook over medium heat, stirring occasionally until cranberries soften and pop, about 8-10 minutes. 3. Add the cranberry mixture to a food processor and puree until smooth. 4. Press and strain the puree through a fine mesh sieve to remove the skins. 5. Set aside to cool to room temperature. 6. Preheat oven to 325°F (163°C). Line a 9-inch (23cm) springform pan with parchment paper in the bottom and grease the sides. 7. Combine the crust ingredients in a small bowl. Press the mixture into the bottom and up the sides of the springform pan. 8. Bake the crust for 10 minutes, then set aside to cool. 9. Cover the outsides of the pan with aluminum foil so that water from the water bath cannot get in. Set prepared pan aside. 10. To make the fudge filling, add the chocolate morsels and vanilla extract to a medium bowl. 11. Heat the heavy whipping cream until it begins to boil, then pour over the chocolate chips. 12. Allow the cream to sit for roughly 5 minutes, then whisk until the mixture is smooth. Set aside. 13. Preheat oven to 300°F (148°C). 14. In a large mixer bowl, mix the cream cheese, sugar and flour until well combined (Use low speed to keep less air from getting into the batter, which can cause cracks). Scrape down the sides of the bowl. 15. Add the sour cream and vanilla extract and mix on low speed until well combined. 16. Add the eggs one at a time, beating slowly and scraping the sides of the bowl after each addition. 17. Fill the crust with about 1/3 of the cheesecake filling. 18. 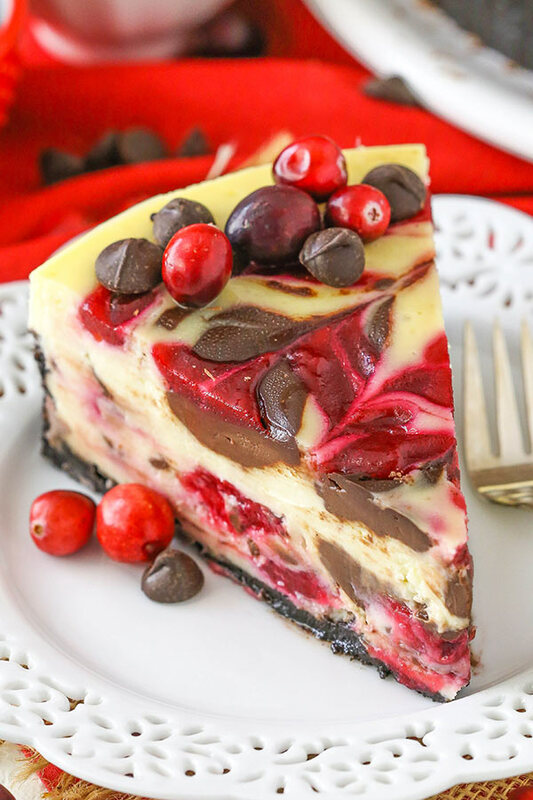 Drop small spoonfuls of the cranberry filling and chocolate fudge filling onto the cheesecake filling, using about 1/3 of each. Use a toothpick to run througeh the spoonfuls and swirl them around. 19. Repeat with another layer of cheesecake filling and cranberry and fudge filling. 20. Add a final layer of cheesecake filling and the remaining cranberry and fudge filling, again swirling to create a swirled pattern on top. 21. Place the springform pan (covered with aluminum foil) inside another larger pan. Fill the larger pan with enough warm water to go about halfway up the sides of the springform pan. The water should not go above the top edge of the aluminum foil on the springform pan. 22. Bake for 1 hour and 20 minutes. 23. Turn off heat and leave cheesecake in oven with door closed for 30 minutes. 24. Crack oven door and leave the cheesecake in the oven for about 30 minutes. 25.Remove cheesecake from oven and chill until firm, 5-6 hours or overnight. 26. Once firm, remove the cheesecake from the pan and serve.